Plants vs. Zombies is a tower defense video game developed and originally published by PopCap Games for Microsoft Windows and Mac OS X (now macOS). Plants vs. Zombies was first released May 5th, 2009 through Steam, and soon on August 8, 2010, Plants vs. Zombies Game of the Year Edition was released as an free upgrade to PC and Mac users who own the original version of Plants vs. Zombies. Plants vs. Zombies Game of the Year Edition (GOTY or also known as the New PC version) contains additional content such as achievements. As with original game, players play as homeowners who use a variety of different plants to prevent an army of zombies from entering their houses and “eating their brains”. EA Origins is now giving away Plants vs. Zombies Game of the Year Edition free of charge. The free game is the initiative by Origin dubbed On the House giveaway that offers full version PC and macOS games and expansions for free. Once the gamers download the free game from On the House, the game can be kept and played forever. Head to the following URL to get the free full game now. The offer On the House offer is available for a limited time only. 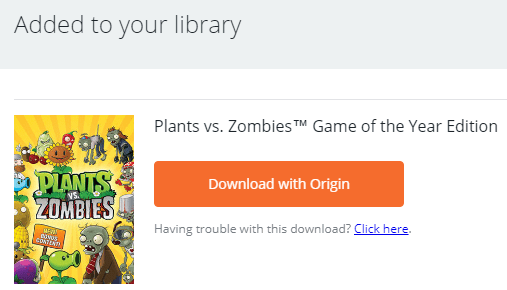 In order to get, download, install and play Plants vs. Zombies™ Game of the Year Edition, you need to have EA Origin account to activate the Plants vs. Zombies™ Game of the Year Edition.